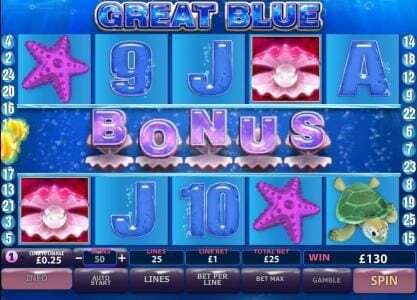 Great Blue Slots has not been reviewed yet, be the first to rate this slot. 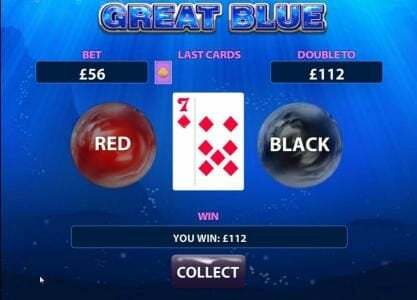 Great Blue is 5 reel, 25 line video slot game powered by Playtech offering a top fixed jackpot of 10,000 coins and a multiplier value of 500x against your total bet giving players an opportunity of winning more than 50,000 coins per spin. 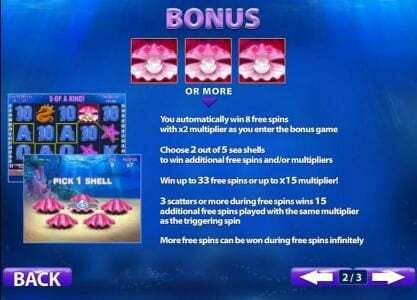 The gaming features offered by this slot game include the Stacked Wild Multiplier, scatter, Great Blue Bonus Feature and the Free Spin bonus round. 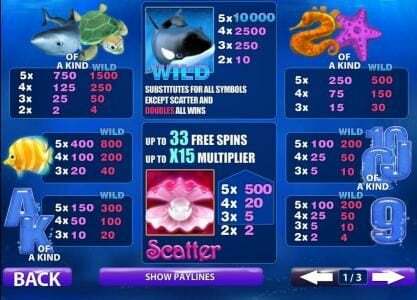 Players can also aim to double their payout by playing the gamble feature game. 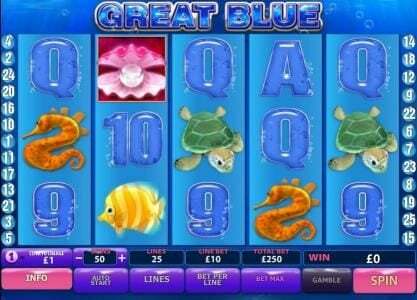 Great Blue Slots is based on a theme of the deep sea world showcasing the underwater wild life at which you will come across a variety of icons to include Shark, Orca Killer Whale, Sea Turtle, Seahorse, Coral Fish, Starfish, Ace, King, Queen, Jack, Ten and Nine. It also offers the autoplay feature and players are also able to adjust the sound as well as adjusting the speed of the game. Its wagering limits are quite flexible at which the slot game attracts all types of players. High rollers can spin the reels with just a max bet of $1,250 while penny Slot players can hit several payouts with just a max spin bet of a penny. Great Blue offers more than 15 payout combinations and its coin denomination ranges from $0.01 up to $5.00. Players can wager a max of 10 coins per payline and in order for players to trigger multiple payouts, all paylines should be made active with a minimum bet of at least $0.25. The Orca Killer Whale icon is wild and appears on all 5 reels thereby substituting all other icons to complete possible payout combinations. Each payout completed by the wild is doubled and also appears stacked on the reels thereby acting as a stacked wild multiplier. 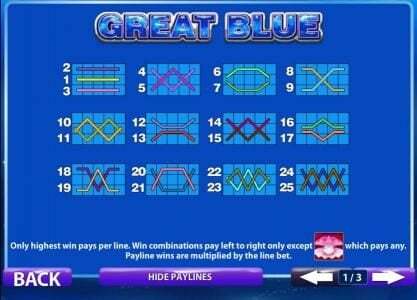 The Great Blue Bonus Feature activated by the Clamshell scatter automatically awards 8 Free Spins and a multiplier value of 2x. 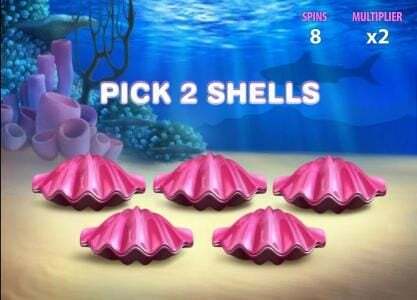 In addition, you select two more Clamshell icons to receive additional free spins and multipliers. 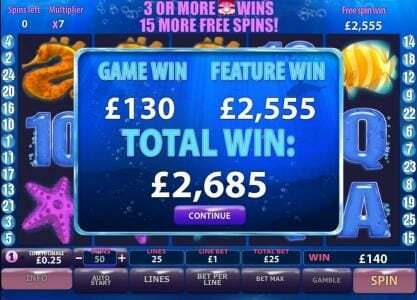 You can win up to 33 free spins and a multiplier value of up to 15x. In addition, Clamshell scatter awards scatter multipliers of 2x up to 500x when 2 or more scatter icons appear anywhere on the reels. 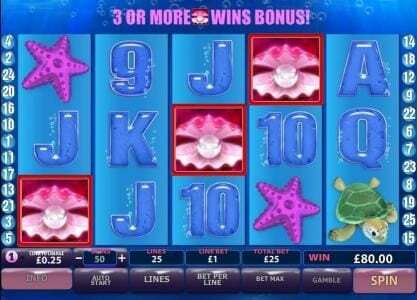 The gamble feature is activated each time you hit a payout. 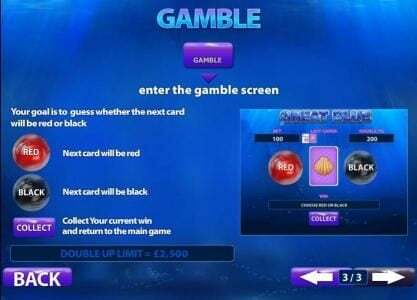 Players can either opt to play or not to play the gamble feature and allows you to gamble with half or the entire payout. In the gamble feature, a player would have to guess the card color – red or black of the card shown on screen face-down. A correct guess doubles your payout whilst a wrong guess forfeits your payout.